Taking a beauty cue from our ancient Egyptian ancestors of the world, one woman started the revival of mineral makeup in the mid-90’s. Leslie Blogett, creator of bareMinerals and Executive Chairman of BareEscentuals, took her passion of cosmetics and her brave ability to think beyond the surface level of a product and in 2001, became the #1 best selling brand on QVC. So, what’s all the gush about mineral makeup? 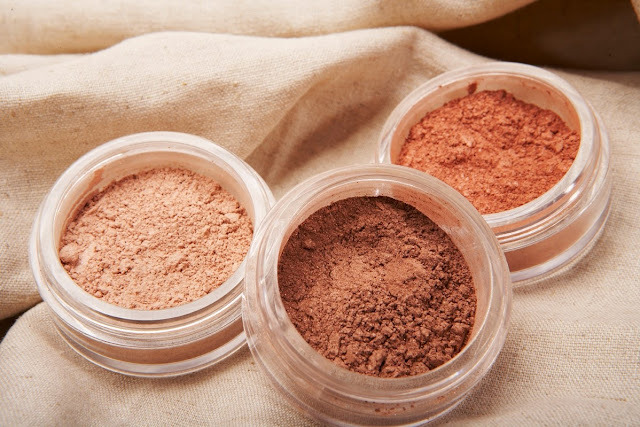 Sure, this alternative to traditional foundation offers even skin tone and works well for those of us with a more sensitive dermis, but what other benefits does mineral makeup bring to the vanity table? 1. Illumination – The titanium dioxide in mineral makeup has a highly reflective quality, making this element fantastic for exuding the skin’s radiance. 2. Oil-free – mineral-based instead of oil-based means coverage without the clogging of pores. 3. Long-lasting and concentrated color – Minerals are mined and come in a rainbow of vibrant colors, so less is more when applying color. 4. Contains anti-inflammatory benefits – An FDA approved skin protectant, the zinc oxide in mineral makeup can soothe irritated skin like rosacea. 5. Available in a wide variety of shades to match your skin tone. 6. A great partner for sensitive skin – With no parabens, mineral oil, dyes or fragrance, mineral makeup is an excellent alternative for those with skin sensitivities. 8. Acts as a natural sunscreen – Providing a bit of SPF protection, titanium dioxide and zinc oxide are physical sunscreens reflecting the sun’s harmful ultra-violet rays. 9. Locks in moisture and feels like you are wearing nothing on your skin as opposed to traditional liquid foundation. 10. Confidence – When you find a cosmetic that compliments your skin type, it’s a dream come true. Not only will you exude a vibrant glow as the reflective element in mineral makeup causes your skin to permeate the world, but your inner glow will amplify your beauty as well. Of course any foundation, whether it be liquid, powder, or mineral pose the possibility that pores can be clogged and result in irritation or breakouts. As with any cosmetic, caring for your skin is key. Invest in quality skin care that compliments your skin type to provide a fresh, healthy canvas for your desired mineral makeup product. After the mineral makeup explosion, many cosmetic companies jumped at the chance of offering their customers the popular makeup line. But be aware that not all products labeled as “mineral” are pure. Many can contain fillers, dyes, and chemicals. A word to the wise? Always read the label and do not be afraid to ask your skin care professional questions. He or she should be able to educate you as well as advise you on the product that compliments your skin. Elizabeth Rago is a freelance writer specializing in health, wellness, and women’s lifestyle content, working with yoga studios, chiropractors, mental health, and wellness practitioners. Elizabeth writes the weekly column, The Circular Home for Chicago Shopping (an editorial partner of the Chicago Tribune) and is Senior Editor of All Things Girl, highlighting topics related to the modern domestic woman. She has been published in Mamalode Magazine, MOMentumNation.com and thesavvyfreelancer.com. Connect with Elizabeth on Twitter, LinkedIn, Houzz, and Google+.